The mum-of-three has called the problem a "reoccurring nightmare". New evidence proves it's becoming increasingly difficult to control an explosion in the rat population across the West. Research by ITV News has found they've developed a resistance to poison, as David Wood explains. A new body of evidence has proven that rats across large swathes of Britain have now become genetically evolved to withstand common household poison. Random tests found that rats in some towns were 100% resistant to over-the-counter poisons, including Salisbury, Swindon, Bradford on Avon, Tewkesbury, Gloucester and Melksham. 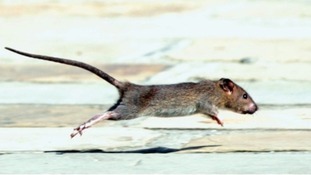 The study spent seven years collating the information, using rats tails gathered by pest controllers. The study showed rats in Trowbridge were just 80% resistant, and in Bristol the figure is just 50%. New evidence has shown rats across Britain have now genetically evolved to withstand poison, so what are councils doing to stop it?